I realize that I've waited almost three months to publish this, but it's been in the works for some time. 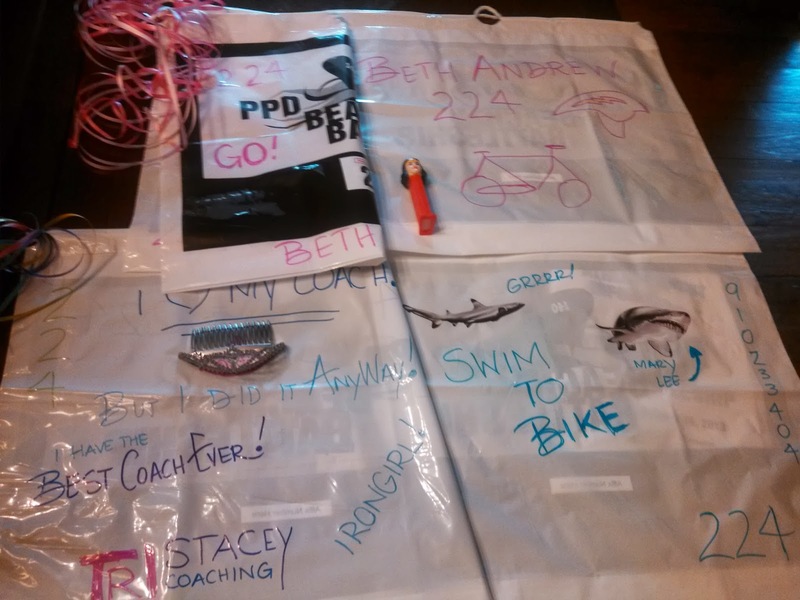 Who knew there were so many details - thoughts, emotions, physical cues in 13 hours of an ironman? I want to remember everything - but fear publishing too much. Plus, writing it has been a way to hold onto the AMAZING DAY. I woke up at 4:15am as planned. Transition A was already set up in my closet: tri top, sports bra, heart rate monitor, tri shorts, sweat pants. This time, I didn't dress in the dark. After months of training, I had a routine that I could sorta sleep-walk through: take the dog out, feed her, start the kettle, prep my coffee cup, check the forecast three times. Once on my phone app: 38 degrees and calm, again on the Weather Channel: 41 degrees and 9mph winds and wunderground.com: 38 degrees and 5mph winds. I looked at the tides once more - as if it would change. I went through the motions of the morning - ate breakfast (mini blueberry bagel, a two-egg fritatta, part of a smoothie and coffee!!). Gathered my special needs bags, my nutrition and my gear and headed out the door. Lots of Bags. Decorated to See in a Flash. 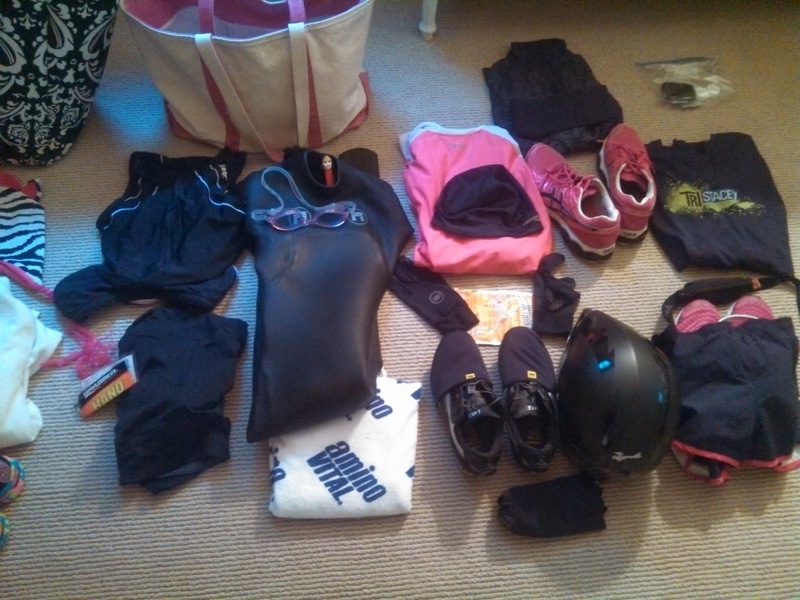 Unfilled one Day....Full of Stuff on Race Day. Ace and I arrived at Jen's at 5:30. Erica and Jen were gathering Erica's gear. I foam rolled while Emerson tried to lick my face. We sipped coffee for a bit and decided it was TIME TO GO! Let's put on some spandex and do this thing. We climbed back in the truck and headed to the south end. In a way, it felt like any other Saturday morning ride. Jen sang loudly and was more excited than we could handle and Erica asked to turn the music to something else. We parked at the South End Surf Shop to don our wetsuits and look for change next to the parking meter. Neal and Jen rode bikes while Erica and I skipped, hip openers, karioked and side stepped down the street to the south end. Did I mention that Jen was excited. She could barely contain herself. 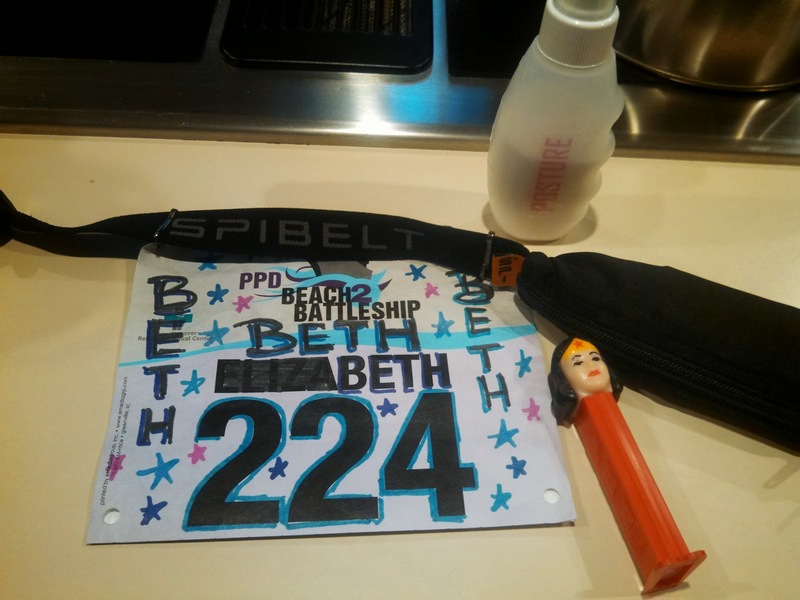 Her excitement amped us all up and that one mile was a roller coaster of anxiety and thrills. We met Tina, Leanne and Ben at the gazebo and started our journey to very south tip of Wrightsville Beach. It was a very eerie. Everyone walked with their heads down and our hushed voices were swallowed by the sand. 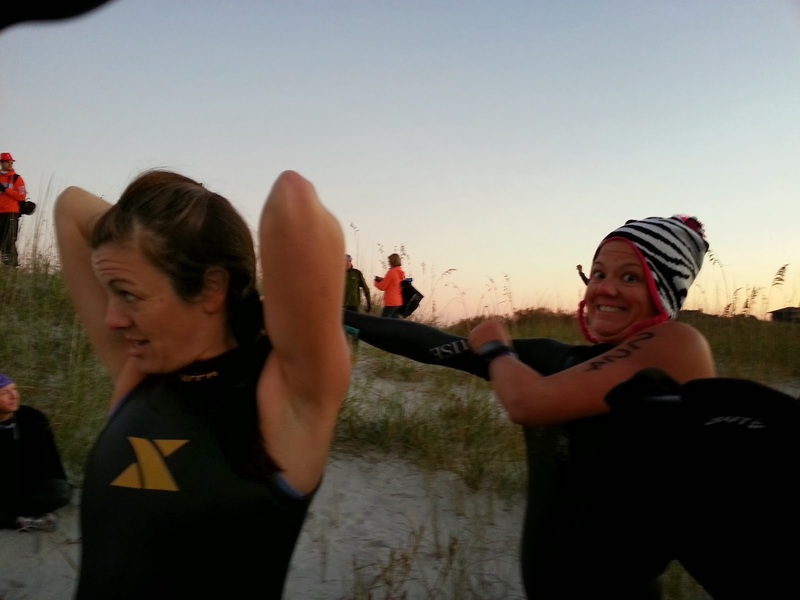 Once we arrived near the start chute, we stripped off sweatshirts and warm clothes and finished dressing in wetsuits. The shoreline atmosphere was louder, but still a little subdued. Tim Bomba cranked the music and announced my name and mentioned my journey from volunteer to relayer in the half, to half competitor twice and now my first ironman. I jumped up and down! That's me! That's me! I exclaimed. I kissed Neal and hugged Jen and met Erica in the front third of the crowd. Before I knew it Tim was playing the Star Spangled Banner. Midway through the anthem, I realized my goggles were full of sand so I trotted to the waters edge and swished them around in the cold water. I turned and looked back at the crowd in the chute and a thrill of realization hit me. I was IN THIS. Then, Eminem's song LOSE YOURSELF was blasting. There was a countdown and the air horn. Erica and I joined hands and raised them above our heads. We shouted or cheered until we reached the water and then we were racing! It was not as hectic or chaotic as I imagined. I tucked in beside Erica and behind some strong dude and got into a good rythym early. My feet were cold from standing in the sand, but everything else felt great. I worried about the tide - worried that I'd be fighting the current for a while, but I soon realized that 809 of my best friends were pulling me along. I was past the coast guard station in no time. The water was clear and really gorgeous! It was green and I could see every arm stroke. I stayed mid channel and enjoyed the ride. I sighted on some purple caps ahead of me in the first mile and soon passed them. The sun started to rise above the houses as I passed the one mile mark at the seaside club. About that time I could hear the crowds of half iron athletes. I did a few breast strokes and watched as swimmers around me splashed sunlit strokes beside me. A mist rose just above the surface – the warm bodies causing fog in the cold air. It was a beautiful sight. The turn buoy at the Blockade Runner appeared faster than I expected and I was pleased to take a left into Mott’s channel. It felt like the tide picked up right about then and slingshot me through the channel and towards Seapath. When I reached the swim finish I was amazed to look at my watch and see I was a 13 minutes ahead of schedule! I stopped my watch at 1:04 and had fully expected a one hour:17 minute time. I was nervous that my feet wouldn't work -- I could barely feel them -- but managed to hobble up the second ladder and the ramp before finding a wetsuit stripper to tug my wetsuit off my body. 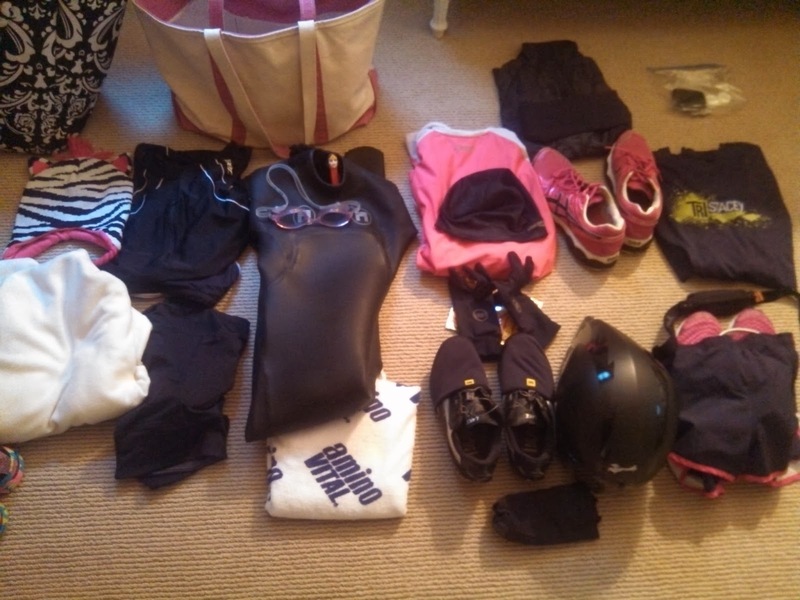 I jogged down the sidewalk with wetsuit in hand towards Transition. I passed the photog and coach on the way. Hi, Coach! I yelled. You're finished already?! she exclaimed back. I grinned in response. Look at my leg muscles!